German painter. From 1816 to 1821 he studied drawing under Traugott Faber (1786-1863) at the Freimaurerinstitut in Dresden and from 1823 to 1825 he was at the Kunstakademie. In 1829 he began his career as an artist, initially painting portraits of his noble relatives in Hannover and Silesia. 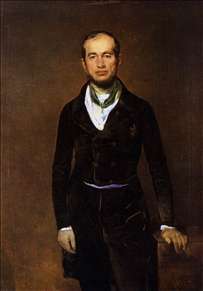 From 1831 to 1834 he lived in Dresden, receiving numerous portrait commissions. In 1834-35, while in Paris, he was influenced by the paintings of Delacroix, Gricault and Gros. His use of colour became freer, and his compositions more dramatic and dynamic, especially in the historical subjects he attempted (e.g. Murder of Thomas Becket, c. 1835; Dresden, Gemäldegalerie). From 1840 until his death he lived in Dresden, though he made frequent visits to other parts of Europe for long periods of time. He secured his reputation as a portrait painter with such works as Graf Haubold von Einsiedel (1855; Berlin, Staatliche Museen). He also painted animals and hunts and, less frequently, military, historical and mythological subjects. His style of picturesque realism was uncommon in mid-19th-century painting in Saxony. His few plein-air landscapes (e.g. Wermsdorf Forest, 1859; Dresden, Gemäldegalerie) anticipate Impressionism. See more details about "Portrait of Count Zech-Burkersroda"